Despite last week’s blizzard flop, New York has still settled into a very cold and windy frozen tundra. This makes getting dressed in a somewhat interesting outfit incredibly difficult, even after mustering up the motivation to leave your house. To stay warm and stylish, without resorting to a giant puffer coat and leggings, layers are absolutely required. There are endless articles on layering, including how the J.Crew models where four shirts and don’t look like a crazy person, but I’ve decided to pare it down to the essential top layers that will beat boredom and chill in the months ahead. Chunky knits are ultra warm and cozy, but make layering difficult. While they may be perfect for skiing, I prefer warm thin knits for layering under vests or jackets. In a slim extended cut they can be just as cozy without the added bulk. I remember the first time I bought a short sleeve turtleneck and my sister could not figure out how that made sense. Now I’m tempted to get this longer sleeveless version. A tunic length is perfect for making leggings respectable outside the gym, and sleeveless is perfect for layering under a blazer or cropped jacket. I’m not much of a cardigan fan since they make me feel a little matronly. However, a huge wrap sweater I can totally get behind. I like to layer these under a warm coat for ultra chilly days, plus when you wrap the lapels over your chest you can eliminate a scarf. 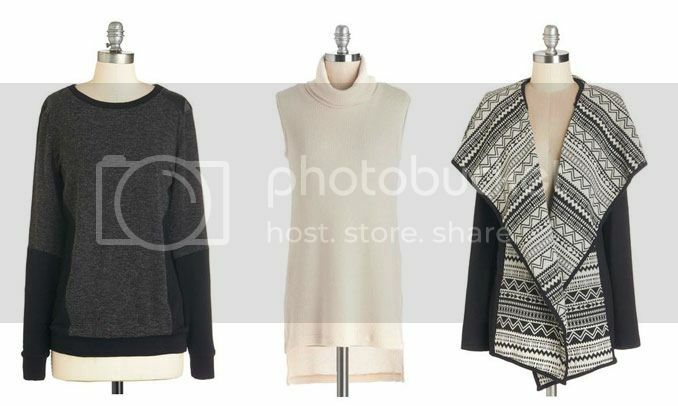 This entry was posted in Shopping and tagged Layering, Shopping, Sweaters. Bookmark the permalink.